Whether you’re planning a first trip to Kentucky, or have been living in the Commonwealth all your life, Kentucky’s Mint Julep Tours has added several new exclusive experiences to show you a side of the bourbon capital of the U.S. you’ve likely never seen. The tourism and transportation group has added a new line of “Elevated Experiences” to give their guests top shelf tours at some of Kentucky’s finest distilleries, restaurants, and more. If you’ve seen Top Chef: Kentucky, you’ll recognize familiar faces on this tour like Nic Christiansen at Butchertown Grocery, David Danielson at Stone Inn, and Edward Lee (himself a former Top Chef contestant) at MilkWood. For $119 per person, you’ll taste through the chefs three course dinner paired with cocktails and guided transportation. Start out your seven hours in Heaven with a guided tour of Heaven Hill distillery, complete with a top shelf tasting in Rickhouse Y. Then head to the Evan Williams Bourbon Experience in downtown Louisville for a distiller-led private tour and a premium whiskey tasting paired with appetizers and desserts. For $185 per person, you’ll get two distillery tours with elevated tastings, heavy appetizers, cocktail, desserts, guided transportation and a signed bottle of Evan Williams single barrel bourbon – for a nightcap, of course. 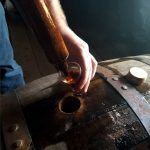 On The Trifecta Tour, you’ll tour and taste at both Woodford Reserve and Old Forester’s distilleries before heading to Brown-Forman’s cooperage to see how bourbon barrels are made. For $214 per person, you’ll get three private tours, two premium bourbon tasting experiences, a craft cocktail, lunch and guided transportation. See the Brown Forman Cooperage exclusively with Mint Julep. Mint Julep is offering the exclusive chance to tour the Brown-Forman Cooperage and “go behind the barrel inside one of the world’s largest barrel production facilities where Old Forester, Coopers’ Craft and Woodford Reserve barrels are made.” The cost is $75 per person and includes cooperage tour, guided transportation and Coopers’ Craft goodie bag. Visit three craft breweries and discover Kentucky’s growing beer scene as you taste brews at Against the Grain, Great Flood, and Monnik. For $79 per person, you’ll take three brewery tours with tastings, get guided transportation, and sport a tasty pretzel necklace. Bourbon and horses: that’s what Kentucky does. See adorable thoroughbred foals at Sun Valley farm before heading to Buffalo Trace for a tour of one of the country’s oldest distilleries. For $139 per person you’ll get a distillery tour with tasting, horse farm tour, lunch and guided transportation. The post Mint Julep Tours Adds 6 All-New Curated Kentucky Experiences appeared first on The Bourbon Review.